Make your 2006 World Series ticket stand up and shout. 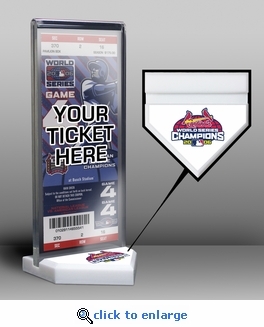 This two-piece stand accommodates a vertical or horizontal ticket in a 3/8-inch thick, clear-acrylic holder and has a home-plate style base featuring the World Series champions logo. 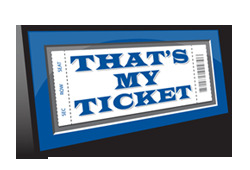 Features: Displays tickets measuring up to 3 1/2" x 7 3/4". Base measures 3 1/2" x 3 1/2" x 1/2". Acrylic holder measures 3 1/2" x 8 1/2" x 3/8". Officially licensed by Major League Baseball. Make your 2006 World Series ticket stand up and shout. This two-piece stand accommodates a vertical or horizontal ticket in a 3/8-inch thick, clear-acrylic holder and has a home-plate style base featuring the World Series champions logo. Features: Displays tickets measuring up to 3 1/2" x 7 3/4". Base measures 3 1/2" x 3 1/2" x 1/2". Acrylic holder measures 3 1/2" x 8 1/2" x 3/8". Officially licensed by Major League Baseball.